A term frequently misused to describe beetles in general, but actually applicable only to a distinctive group of beetles with long, pointed “snouts” which they use for boring into whole grains, hard processed cereals such as pasta and timber. Weevils are instantly recognisable by their elongated snouts, they are oval shaped, dark brown in colour and about 3-4 millimetres long and shiny in appearance. The grain weevil is widely accepted as the most common pest of stored grain They are usually found in grain storage facilities or processing plants, infesting wheat, oats, rye, barley, rice, and corn. Although not often found in the home, sometimes they infest table beans, acorns, chestnuts, birdseed, sunflower seeds, and ornamental corn. The female weevil (males are rarely seen) emerges from the soil in early spring. Over a 3-4 month period each adult can lay 1000 eggs close to suitable host plants. Not all of these will hatch. The larvae emerge after about 2 weeks then tunnel into the soil or compost, feeding on plant roots. After approximately 3 months, as the weather cools, the larvae burrow to overwinter at a greater depth. As the temperature increases in spring the larvae pupate, and, 3 – 4 weeks later, new adults crawl from the soil. In homes and heated glasshouses consistent warmth enables weevils to be active all year round and to complete the cycle in less than a year. If you find them in foodstuffs return them to the shop and complain. The affected food should be destroyed. Spray cleared shelves with aerosol or put powder in cracks and crevices. Choose a product labeled for stored product insect control. 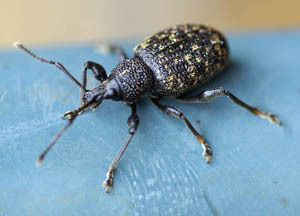 If you suspect you have a weevil infestation in Edinburgh, Glasgow, Aberdeen, Dundee or Perth, call GRAHAM pest control today and we could help.